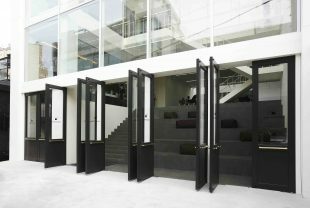 Located near Seoul Dosan Park, MANMADE WOOYOUNGMI officially opened its doors on May 2012, introducing its flagship brand “Solid Homme” and designs by none other than Woo Young-mi herself—in a culture complex of male fashion brands and a café street for visitors. MANMADE WOOYOUNGMI begins from the second floor to the fifth, with each level expressing its unique aura. Visitors will find on the second floor the MANMADE SQUARE & CAFÉ where drinks and desserts made by various artists are put on display and sold. Customers sit in the spacious café and select their orders. The interior layout; the placing of furniture, the knitted seat cushions, and the customized black and white bill, all suggest a particular WOOYOUNGMI-ness and minimalism to the area. The third to fourth floor consist of shops displaying Woo Young-mi designs for men’s attire and the fifth floor presents her flagship store, “Solid Homme”; these floors, like the level below, contain a unique sense of the designer within the interior design. For a designer who had felt “that there was no space just for men in fashion”, the concept of space and spatial layout was important in creating the WOOYOUNGMI complex. Korea’s first café, gallery, and flagship store complex, MANMADE WOOYOUNGMI, is scheduled to open its second store in Marais, France in early 2018.